This SMARTboard file is full of interactive fun for learning the various Halloween vocabulary related to this story. 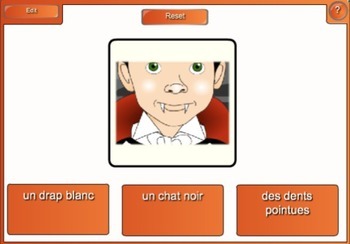 It includes audio files that will get your students laughing, dancing and listening in French. From digital flashcards to speed-touch games (like fly-swatter), this file has over 70 pages of beautifully illustrated images (by Nathalie Bonneau) and over a dozen different variations of games, with 30 interactive vocabulary game slides. 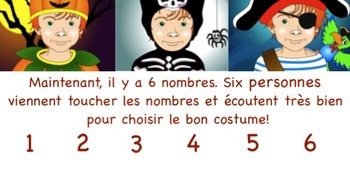 Vocabulary includes costumes and accessories from the story "Un costume pour Halloween." 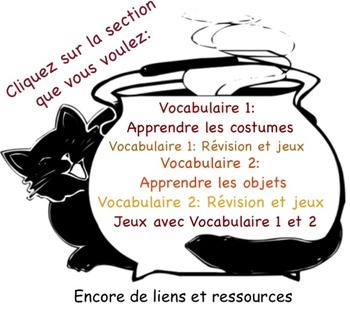 French learners of all ages and literacy levels can enjoy learning this vocabulary and these vocabulary games! A French teacher who has tested this file said: "This SMARTboard file is amazing! You could spend days doing all of these games and activities!!!"